November 04, 2013 (Kitchener, ON) – FlightPath International (FPI) is proudly featured in the November / December 2013 Canadian Skies magazine with an exhaustive six-page study detailing FPI’s background, achievements and future goals. On newsstands everywhere now. 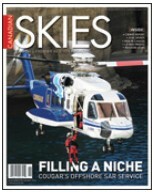 Canadian Skies is the only magazine dedicated to providing extensive, in-depth coverage of the Canadian aviation industry. Featuring stories, articles, and columns from all sectors of the industry: business, private, commercial, military, cargo, maintenance, training and more! Canadian Skies goes into the field to tell the stories that define Canadian aviation. FlightPath International Limited is a Canadian-based Approved Training Organization that operates in 60 countries throughout the world delivering Pilot and Technical training, which includes its world-class Multi-Crew Pilot License program. Maximizing customer value through the delivery of quality courseware and programming by means of attracting and retaining the best people in the industry. FlightPath achieves excellence in training by applying its core capabilities through profitable growth initiatives.